Docker is available in many different flavours, the original Linux container can be run on most platforms, either natively or as an ultra-light VM layer. Initially Docker could only run on Linux but then the docker toolkit was released for the Mac and for Windows. This allowed the Linux containers to run on this ultra-light VM layer. More recently the revised ‘Docker for Mac’ product has been released, this still runs Linux containers but is much improved. It comes with all the optional tools that are available on Linux installed as standard. These include docker compose, Kubernetes orchestrator (as well as Swarm), the Kitematic etc. This is because the Mac version is aimed at developers and not production, but for the purposes of running Acorn related applications the Mac version (or older windows toolkit version) is fine. Windows has also gone through a revision of the initial docker toolkit. The new version of docker on windows can run Linux containers under Hyper V or it can run the new Windows containers natively. This comes at a cost in that it now requires 64 bit Windows 10 Pro or Windows 2k3 server. Currently windows containers cannot run on other platforms, not even MS Windows running the older Docker Toolkit. Installing Mac or Windows versions is pretty straight forward. You can go store.docker.com and select you flavour, then download and follow the standard install process for your platform. You generally don’t need to worry about the ‘edge’ version, or switching on experimental features, or even changing the default config, if all you just want to run is containers from an image hub/respository. For Mac or Win10 64bit go to https://store.docker.com/. You can also download an install for the AWS & Azure Clouds; although many Cloud providers have some sort of Cloud Container Service. Linux is a bit more fun as different flavours of Linux have different package management systems. The problem with Linux distros is they do not tend to update major version within a distro’s lifetime. Docker being a fairly new product, in the modern devops world, is fast moving and you could be missing out on many must have features because you Linux version is sticking to the same machine version. The options therefore are to play around with the package repository source to get the latest packages, download from the link above, or use the docker unix/linux install script that can be curled and piped to shell. The script method is generally the easiest way if you use lots of different flavours of unix as this method is the same whether you want to install on a Linux distro that uses yum, apk, aptitude or apt/apt-get. The primary flavours of Linux supported are Fedora, CentOS, Debian and Ubuntu, other flavours of Linux are not supported directly but may work. If you wish to use Docker on the Raspberry Pi you can also use this script, or you can use a Pi Docker distro called Hypriot which is designed for the purpose of running Docker on Raspberry Pi. Note: It is important that if you install with one method you stick with this method for updates and upgrades, otherwise you may run into issues. One you have installed docker you need to run something. Depending on how you installed docker, and what platform you are on, you may need to do something with root/super user/admin privileges. E.g. add your user to the docker group, use sudo, or do something with windows administrator. The following commands assume that you can run docker with this higher privilege level, if you have not set it up like this you may have extra steps to do, e.g. put sudo in front of a docker command, or use the ‘run as administrator’ option on Windows. You should see something like this on the Mac. Check you have started the service. 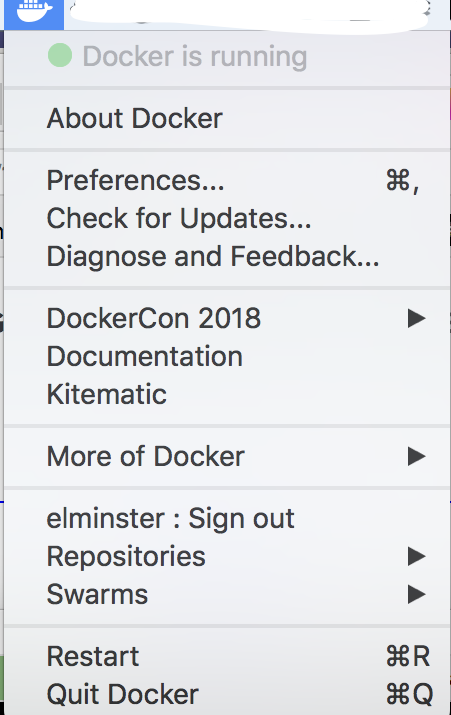 On Mac check to see if the docker icon is in the menu bar. If not then start Docker by double clicking icon, if it is running then check you see a green status circle. Windows is similar to Mac except the icon will be in the taskbar. On Linux use systemctl (or equivalent) to check the docker daemon is running. Now we have everything installed and the services running we actually need to start some containers. Containers are created from images in the docker hub (by default, you can get image elsewhere if you wish). You can explicitly download them, but there is no need to, when docker goes to run a container and finds them [the images] not stored locally it will automatically download them. Element (1) is the run command, this simply tells docker to spin up a new container based on the image provided in (6), rather than start an existing one. The ‘-d’ in (2) tells docker to run the container as a background processes. The third element is the ‘-p’ flag, this says 5920:5920. This tells Docker to map port 5920 (right part of ‘:’ ) on the container to port 5920 (left part of ‘:’ ) on the local host. It might seem silly to map the port to the same port, but if you do not use this flag then the port will be blocked from the host. I.e. you wont be able to connect to your container, a virtual firewall. We will skip volumes and go into more depth of these below. The ‘–name’ parameter allows you to name the container as a sensible name, otherwise you will end up with a random system generated container name, as we saw in the examples above. By having a sensible name it makes identification of a container, starting and stoping it, etc., much easier. The final part is the image name. The part before the ‘/’ is the repository name, this will default to a repository of that name on hub.docker.com unless you tell it otherwise, the part after the ‘/’ is the image name, i.e. the application. An optional ‘:’ after the name is the tag, this is usually used for the version details. When docker tries to instantiate a container based on this image and finds it is not available locally it knows it needs to download the ‘latest’ version of application from the repository on hub.docker.com. ‘Latest’ is the default tag if none is specified after the colon. But this is an arbitrary tag and the ‘latest’ may not actually be the latest image. For example the ‘latest’ ubuntu image actually downloads an ubuntu 16.10 image, but 17.10 and 18.04 are also available as images. So to download those you would need to say ubuntu:17.10 (note that there is no repository name, this is because some applications are special and reside at the top level of hub.docker.com). If you created a named volume you will see this in the ‘volume ls’ command, unlike the other volumes which will have obscure system generated name. The nice thing about named volumes is if you remove the running container and then start a new container, you can use the same named volume, This ensures you will have a container in the same state as the previous one, because you reused the store data. Some containers store no data, in which case there is no requirement to reuse or have persistent data. If you never need to change any config and save the setting this is feasible for the Acorn 8bit emulators, in which case you can just use the bind mount to view your saved files. As we have show an example of an emulator with a bind mount above, lets show some storage examples for named and system generated volumes. First we look to see what local volumes we have, if it is a fresh install there should be none. Now we can check we have a running container, notice the system generated name ‘optimistic_lovelace’ as we didn’t use the ‘–name’ parameter. Next we can check the volumes again, and we see we have a volume, with a long complex volume name identifier. If we now stop the running container and do an ‘ls’ again, we will see it has gone. But we didn’t explicitly remove it or use the ‘-rm’ flag in the run command, so the container is still there in a stopped state, we need to use the ‘-a’ flag to see it. Now we have removed the container using ‘-a’ with ‘ls’ when we list containers will show nothing. Notice that rather than reuse the volume the new container will create a new volume, effectively losing any data from the previous container. So we now have two volumes but only one container. You could explicitly remove the old volume, or you can use the prune command which will get rid of any volume not used by a container, although be warned this will also get rid of named volumes, which we will create in the next section. Now we just have the volume from the running container. Now we will look at persistent storage using named volumes, there are much easier to understand than 60 character long random character system generated volume names, and give a clue as to their purpose. We will use postgres again in this example but the same applies to any application, including the Acorn emulators. First we will manually create the volume and check it exists. Now we will spin-up a postgres container but this time we will use the ‘-v’ parameter to indicate we wish to overide the standard volume config. The left part of the string before the ‘:’ is the volume we just created. The right part is the place to map it to inside the postgres container. If we do a ‘volume ls’ again we will see that no extra volumes have been created when we started the container. We also see we now have a container called ‘naught_brahmagupta’ running. When we stop the container this time it will automatically be removed. As mentioned above if this was a system generate default volume the volume would also be removed. But if we check we see the volume is still here, as mentioned before a named volume will not be removed with the ‘-rm’ flag. We will start another postgres container with the same parameters. And again we see it has picked up the existing container rather than create a new one. We see that the container is not only stopped, but also gone. But again we check and the named volume is still there. As mentioned above a volume prune will still remove a named volume if no stopped or running containers are using that volume. We now see the volume has been pruned, even though it was a named volume, something to remember so you don’t accidentally lose data. The other type of volume, a bind mount, mounts a host filesystem directly into the container. We saw this in the Acorn emulator example at the start of the article. This is similar to what can be done with VMWare Workstation, Citrix, RDP/RDS, i.e. a local drive is mounted into a VM or remote server. This allows you to save and load files from you host computer to the target VM or Remote Desktop, this works in effectively the same way for containers. In this case when the container is removed nothing will touch the storage on the host filesystem, so this is another form of persistent storage. In the context of Acorn Emulators you will probably want to mount a local host file system containing all your ssd/dsd Acorn disks into your container running the emulator, you can then load and run all of these disks on the emulators. You could have all the disks as part of the default image, and therefore part of the containers, but if you had 8 or 9 emulators you would potentially have quite a lot of duplication. In addition every time you added a new ssd you would have to add it to every image and container, this would get tedious very quickly unless you have an automated build/management system. Optionally (in addition to a whole raft of parameters and switches) you can add —rm to the command line. This means that when the container stops, either because you explicitly stop it, it crashes or the container naturally finishes (i.e. you click exit on the BBC emulator), it will be removed. Otherwise it will still exist in a stopped state. This is okay if you decide to restart the same container each time, but if you try and create one with the same name it will error. Or if you are letting docker generate the names then you will create container after container, eating up lots of space. To explain this a bit better. Start a container with the run commands above. This shows the container running. And now stop it. The main disadvantage of using the start method is you always keep the same container, so if a new image is pushed to docker hub this will not be used. At least until such time that you create a new container, when it will then try to use the latest image (ie. download the new one). Once you have the container with an image of an Acorn emulator running, and you have mapped a drive with loads of ssds, you are readying to run some games. There are two main issues to overcome, namely the display and sound. Currently the display is done via VNC, the containers displays the emulator on a VNC display. The user (you) then starts a VNC client and connects to the VNC server. If you remember this is what the ‘-p’ 5920:5920 bit was all about. Docker will map the port (by default) to the host main IP address. So if your IP address of you PC was 10.10.10.10 to connect to the emulator with defaults you would enter in VNC client the address 10.10.10.10:5920. You will then be asked for a password, this is currently hardcoded as ‘TestVNC’, this maybe be parameterised at some point in the future. You should now be logged in and viewing the familiar emulator screen. While sound is possible when using VNC it is a little trickier and currently not implemented. There are VNC images for Docker that implement sound but these are quite big (about 5 times bigger than the current images, this makes the images a little unwieldy, and is something that can be looked at in the future). When you have finished using the emulator you have two choices to exit. Choose the ‘exit’ option from the emulator’s menu, or close the VNC window directly. The former will exit the emulator application and cause the container to exit and shutdown. The latter will just kill the VNC client and not effect the application’s container in anyway. If you exit VNC in this way, and then want to shutdown the application without logging in via VNC anymore you can use the docker ‘stop’ command mentioned earlier. Either way unless you used the ‘—rm’ parameter when you started the container it will still exist, but it will now be in a shutdown state. You then have the options for removing or restarting it that were mentioned above. Note there are various commands to sort out how containers react when docker start-up or when containers crash etc. These are beyond the scope of this post, more details can be found in the Docker documentation. In summary use the following to start, connect and stop an emulator container. Keep, or remove container as required. End of part 2. In part 3 we will cover the various containers available and other useful commands.